A unique look into the work of Inspiring Communities - Digby from the perspective of a Community Development graduate. Meet Morgan, a graduate of Digby Regional High School(2015) and a Community Development graduate from Acadia University. As a requirement for her Bachelor Program, Morgan chose to spend her placement working in her home community.Over the last 6-weeks, she has dedicated her time, energy, ideas and passion to the Inspiring Communities Digby team. During her placement, Morgan helped plan, organize and execute the Community Consultation on February 20th, designed images used for the theme handouts (which we permanently nicknamed "Morgan's Web"), supported daily tasks and often kept the team on track with planning next steps. This will be Morgan’s final week, as she heads back to Acadia for graduation this Spring. The team wants to thank Morgan for her amazing work and dedication. She has left a lasting impression on all of us, we wish you the very best in your future career! "Honestly, this experience has me even more excited about working in the Community Development field. Before my placement, I was a little confused about what I wanted to do with my (Community Development) degree and which direction I wanted to take with it. This experience has helped me realize I want to work for an organization such as Inspiring Communities. I absolutely love what I have been doing and I love working with people, and most importantly, working to give a voice to those who may not be heard otherwise. I really appreciated that my passions and skills of event and program planning were utilized, as well as my love for working with youth and people in the community. I hadn’t anticipated how much work it was or the challenges I’d face working within the Community Development field. It required a lot of trust from the community and relationship building. I was able to lead and take on projects and contribute ideas to discussions within the local Inspiring Communities Digby and provincial teams and with many community members. My team were always willing to offer insight or assistance with the projects I was working on. They reviewed and gave suggestions of ways I could improve my work and took time to explain things to me with anything we were working on. If I had a question, they would explain to me why they did something that way and what the significance of it was. I really enjoyed all the projects I worked on and thought it was great that they were able to give me work that fits well with my interests and skills. They are all very passionate about the work that they do and you can tell that they love doing it. They were great mentors for me throughout my placement, making me feel valued and a part of the team rather than a student. It is awesome to see the way they all get along and how supportive they are of each other’s work. When one of them feels like they have a lot on their plate, the others step up and offer to help out or take on some responsibilities. I’ve gained better problem-solving skills from this experience and the best part of my placement was working with people and hearing their story, especially working with some of the youth to hear their opinions and ideas. I have learned a lot about Collective Impact, how to build connections and relationships with organizations and community members and how to collaborate with groups to reach a goal. These are things you cannot learn in a lecture but are experiences you need to gain and experience yourself. Published: Mar 11 at 3:59 p.m.
Michelle Mosher says she won’t change the way she works after being appointed to the Order of Merit of the Police Forces since it’s what led to the recognition in the first place. Mosher is originally from Coldbrook and joined the RCMP after graduating from Acadia University. She’s now an RCMP corporal in Grande Prairie, Alta., where she works at the Caribou Child and Youth Centre within the K Division Serious Crimes Branch and specializes in child sexual and physical abuse investigations, conducting child forensic interviews for police investigations. Having served for just under 10 years, Mosher says her work being recognized this early in her career has only increased her zeal to continue advocating for children. “I want to make sure that I will always try to live and work up to the level that the appointment deserves and represents. …I feel extremely fortunate to be a part of it,” she says. Mosher says she thought someone was playing a joke on her when she returned from vacation in August 2018 to an envelope placed on her desk that read "Michelle Mosher, M.O.M.’"until she remembered a fellow RCMP officer used the same initials following her own name. But she opened the letter and found it was from the Governor General’s office in Ottawa, and that it explained she’d been appointed to the order, and what that meant. Mosher describes the feeling that followed opening her letter as one of total shock. “I didn’t want to show it to anyone because I wasn’t exactly sure what to say,” she says. 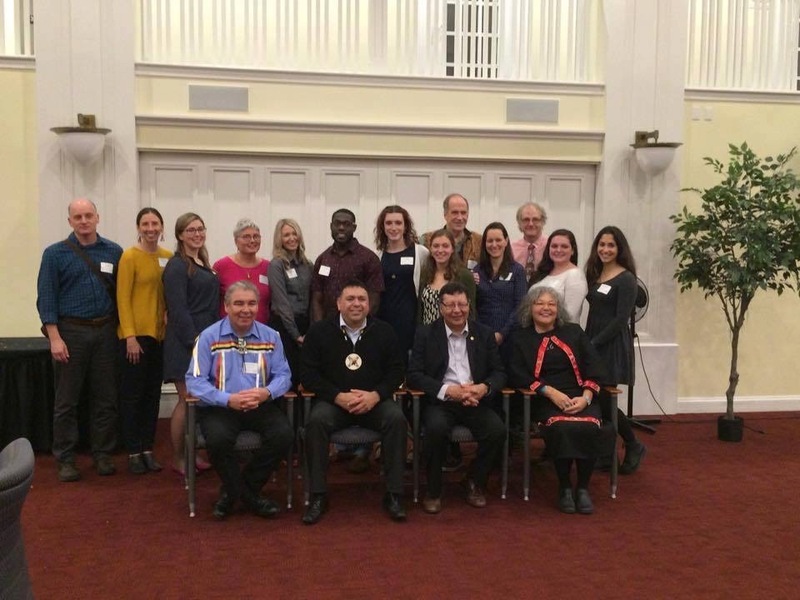 Mosher attended the Jan. 30 ceremony at Rideau Hall in Ottawa with several family members, including her son, and her fellow recipients. As she looked around at the group of high-ranking police officers that included British Columbia deputy commissioner Brenda Butterworth-Carr, she felt even more honoured to be among those recognized. “Julie Payette was very friendly and personable and took a moment to say that she was honoured to meet me. It was an incredible experience,” she says. This appointment is not the only recognition Mosher has received as of late - she’s also been nominated for the International Association of Chiefs of Police Top 40 Under 40. Ingrid Blais Receives "Community Leadership Award"
Ingrid Blais receives the fourth annual Community Leadership Award. This Award is presented to an outstanding community person who has demonstrated exceptional commitment, competence and success over time in building community capacity through local, provincial and/or regional activities and organizations. Ingrid Blais has been a member of L'Arche in Canada since 1984. After graduating from the world renown, University College Dublin, Ingrid worked for a rural based Care Agency supporting people with developmental disabilities. In 1984 she spent a year as a volunteer with L'Arche community in Edmonton. That year stretched to 14 years in L'Arche Edmonton. In 1998 she was asked to take the position of Executive Director/Community Leader for L'Arche Homefires in Wolfville, NS. Ingrid's time as Director ends November 2nd after 20 years in the role. 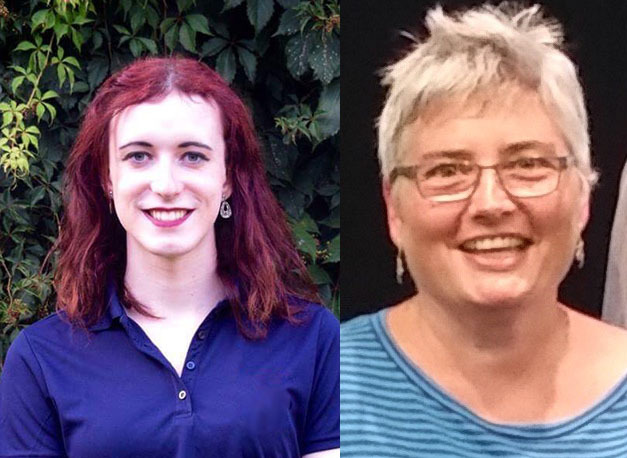 Ingrid is grateful to have lived in Wolfville for the past 20 years; to witness a growing awareness and acceptance of the reality that every person has a right to belong, to be respected and to be a contributing member of their local community. The L'Arche Homefires community operates five homes, three day programs, and an Independent Living Support Program, supporting adults with developmental disabilities in the Wolfville area. 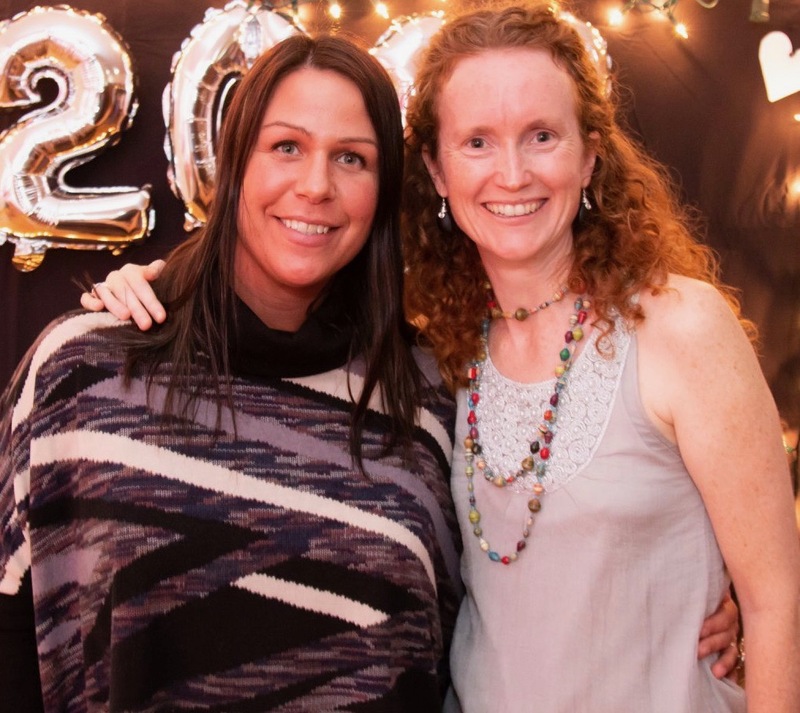 Tammy Mudge Receives Loretta Saunders 2018 Scholarship! Tammy Mudge (4th year, Bachelor of Community Development) has received the 2018 Loretta Saunders Scholarship for Atlantic Canada, which celebrates the life of Loretta Saunders, a strong and successful indigenous woman who was murdered in 2014. Tammy was interviewed for the Nova Scotia Advocate on her reflections about Loretta Saunders and the scholarship. Congratulations Tammy! Check it out here. Tammy is pictured with Kat Powell (BCD 2018) below. The small Nova Scotian town of Bridgewater was recently selected as one of 20 finalists across Canada for the SmartCity Sustainability challenge. They have received $250,000 as a result to put together a final proposal on strategies to overcome energy poverty in the community. Their aim is to reduce energy poverty by 20% by 2028 as a part of their plan to reach a target of being both environmentally and economically sustainable, reducing their greenhouse gas emissions by 80% by 2050. This proposal included a two minute video describing the issue which was created by Myah Rach-Sharpe and Alex Walsh (Bachelor of Community Development grads, 2018) as part of their core term community project course. Congratulations to Bridgewater for their great work on this over years and to Myah and Alex for their valuable contribution to it. Bridgewater was one of only two municipalities in Atlantic Canada to make the finals list! The Bridgewater has been led by their sustainability manager, Leon deVreede (Acadia grad, 2005). Drs. John Colton and Alan Warner have contributed to the work over a number of years from the Department of Community Development. Melissa Grandberg, a co-op honours student in Community Development, was one of 17 students selected from across the country to present the international sustainable development goals at the launch of the Sustainable Development Solutions Network at the University of Waterloo in May. Community Development has joined this network, which is a national partnership of organizations working to implement the UN Sustainable Development goals across a range of levels, from the local to the international. Melissa presented the Reducing Inequaity goal as part of the presentation which preceded a keynote from Jeffrey Sachs. 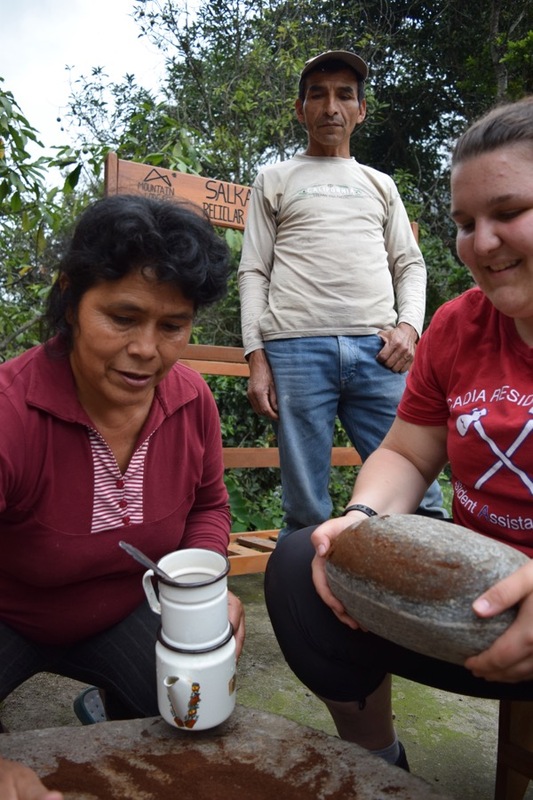 Eight senior, community development students spent three weeks in the high mountains of Peru this past April on the 2018 International Field course, including two weeks living and working in a fair trade coffee community where they tutored English and worked with children in the schools and also worked in the fields to get a feel for a subsistence lifestyle. The first week they spent exploring in Cusco and then took on the challenging high altitude trek to the ancient Inca city of Machu Picchu. Here are a few pictures to help visualize the experience. Linda Best received the third annual departmental Community Leadership award at a ceremony in late March. For more than a decade, Linda has been in the forefront of the movement in Nova Scotia supporting small-scale and sustainable agriculture for the benefit of farmers, the community, the local economy and the environment. She is the co-founder and guiding force as a full-time volunteer behind FarmWorks Investment Co-operative Limited, a ground-breaking Community Economic Development Investment Fund, a one of a kind in Canada. To date FarmWorks has raised $2,225,000 and has granted over 85 loans to food-related businesses across Nova Scotia. She also founded Friends of Agriculture in NS and to organize the 2009 and 2016 Nova Scotia Food Summits that brought together over 200 people to foster greater understanding of the challenges and opportunities in Nova Scotia’s food system. Friends of Agriculture in NS puts on the gourmet yearly local dinner entitled April Flavours, the proceeds from which go to supporting education and advocacy efforts for the local food movement. 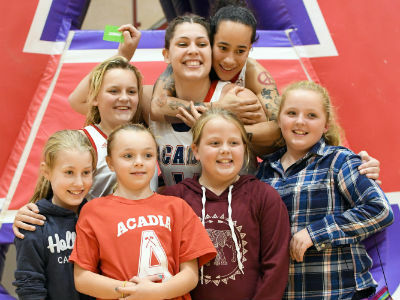 Allie Berry, Community Development graduating student and varsity basketball player received the Prentice Citizenship Award from Acadia Athletics for her work in the community with the Youth Portal in Kentville, which has included initiating and leading the Rec Buddies program in which Acadia students are paired with and mentor youth in the local area. Check out the wonderful story of her work! Peggy has been a community activist, innovator and organizer in areas such as peace and security, education, agriculture, health care, social housing, and women issues for more than a half century. In 1959, Peggy was a founding member of the Voice of Women, which mushroomed to 10,000 members across the country within a year. Its work was to advocate for peace and common security in the face of injustice, the oppression of women and the insecurity of the Cold War. She was a prominent and long standing activist in the peace movement through to the fall of the Berlin Wall in the 1990s. She worked with several others to spearhead a 1984 vote in which Wolfville became a nuclear weapons free zone. Among other roles, Peggy who is a trained nurse, worked many years for the VON (Victorian Order of Nurses), was a founding member of the Kings Environmental Group in the 1980s, a dedicated volunteer with the food committee of Ecology Action Centre, and an advocate for social housing for seniors. Peggy ran for the NDP for parliament in 1984, though she disagreed with NDP defense policy of the time, and went onto play an important role in shifting it to a common security framework in the late 1980s. Peggy’s positive contributions to our community and the world have been vast and diverse over so many years. An interesting reflection on her life and roles in the peace movement can be found here. 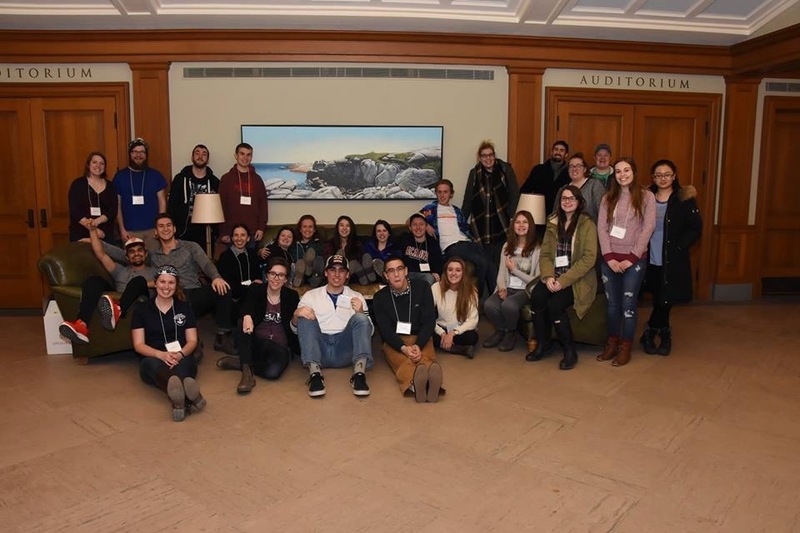 The Acadia Community Development council (ACDC) student executive hosted a professional development conference, open to all Acadia students, with preference to Community Development students, and was held on March 25-26th, 2017 at the K.C. Irving Environmental Centre. There were a total of 31 participants. This biennial conference included incredible keynote speakers, professional hands-on workshops on topics including self-care, goal setting and zine making, as well as energizers led by students from the Festival and Events course. The conference also included a delicious lunch at the Wolfville Farmers Market. The opening keynote speaker was the dynamicBuhle Dlamini, a motivational speaker who was raised in a rural village in South Africa, and beat the odds to become a top South African entrepreneur and global speaker. Our closing keynote speakers were Dave and Adrien Greene, who spoke of overcoming adversity, building resiliency and engaging with the natural world while on an incredible 28 day extended winter wilderness snowshoe experience and the parallels that can be drawn from challenges faced while finding our way through life, post-graduation. The main organizer of the conference was Leslie Ubels, who was the professional events coordinator on ACDC. The main sponsours of the event were the ASU Wellness Fund, and the Dean’s Office of the Faculty of Professional Studies. The process resulted in rich dialogue and sharing of ideas. Thank you to all who put them together! The Community Development Program has received approval for co-op to be added as degree options for all of the community development degrees. Ellie Valle (above left) is our first enrolled student and she will be doing her work term this fall under the mentorship of Cari Patterson (above right) with Horizons Community Development Associates! Students can apply for co-op at the start of their second year and over the next three years they complete three co-op work terms in addition to their regular program, and one of these must be during an academic term. This degree option provides a great opportunity for students to gain career experience, apply their learning in work settings, and make some money in the process. Typically students take an extra term to graduate. They are responsible for finding work placements but receive assistance from the Acadia Co-Op office and Community Development faculty. The co-op staff have a professional development program for co-op students to help them search for placements, obtain them, and then succeed with their work terms. For more information, students should contact their academic advisor.